Everyday life can be taxing on your legs – long periods spent sitting, such as commuting, working at a desk or attending long meetings take their toll. It’s no easier for anyone who stands for long periods either – standing work desks, benches, counters and even security work can make legs ache and even swell up. 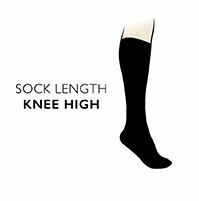 These fine, soft knee high Falke Energising Cotton Socks add comfortable, stimulating upwards pressure that helps circulation of blood, revitalising legs round the clock. The fine weave and cotton rich content makes these socks look as stylish and elegant as any business sock, while delivering light-to-mid-level compression and excellent breathability. Falke Energising Cotton Socks have a perfect fit, due to a seamless toe, ergonomic right/left foot-specific design and are made to deliver a wrinkle-free fit on the legs. An Ultra Energising version, with higher compression, is also available.